The property is protected by a iron fence just behind the trees. 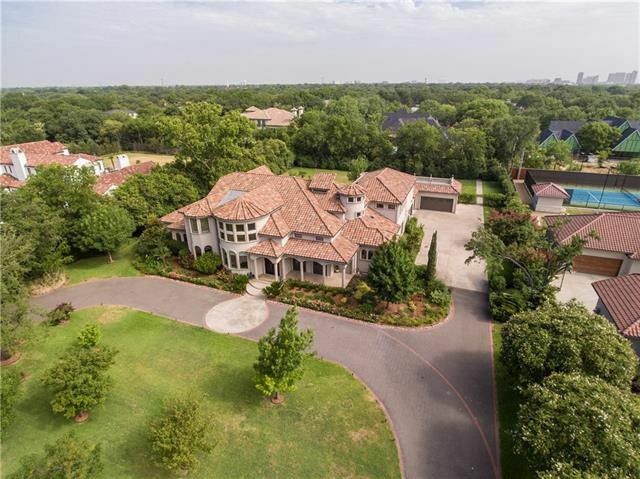 The side-entry gate opens to the five-car garage, and the spacious driveway offers additional protected parking when the front gate is closed. 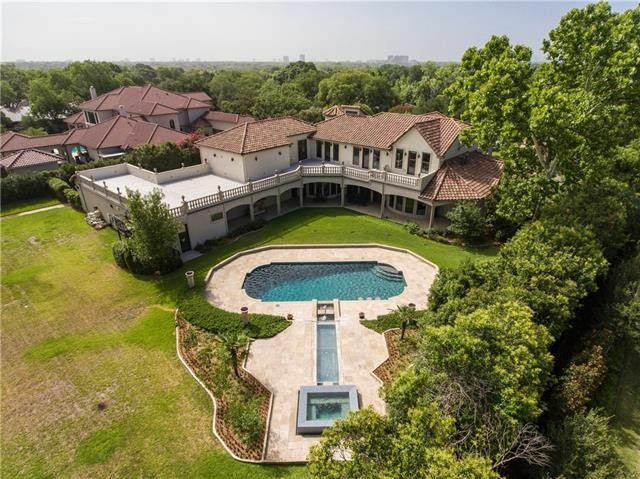 The pool and hot tub are connected with a water feature and imported tile that stays cool in summer. The pool also has a built-in cleaning system. Access to the terrace from the pool area, through an iron staircase. This destination is rich in amenities, laden with lavish comfort. Imported Syrian marble reflects the light from oversized windows throughout the downstairs, while expansive ceilings and striking finishes evoke a sense of warmth. 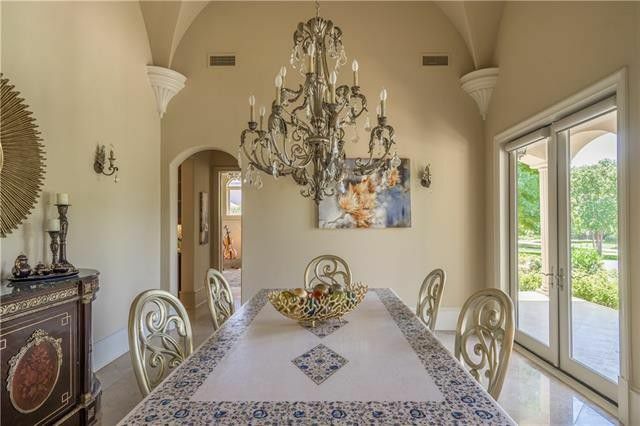 The bespoke craftsmanship and luxe details make this house a sumptuous experience. Take, for example, the entryway. Oversized, custom iron front doors open to a gracefully curving staircase with iron balustrades and a front seating area with automatic shades by designer David Salem. Walk further into the open concept living room where a marble gas fireplace is flanked by rich wood built-ins that reach to the high ceilings. Double-sided glass doors overlook the resort-inspired backyard. 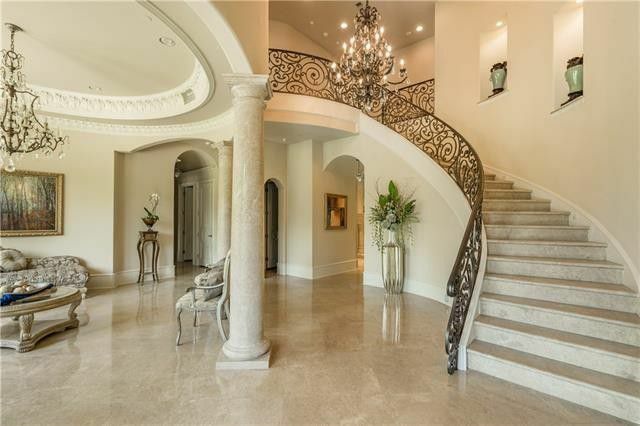 A double-height entryway features a sweeping staircase with custom iron balustrades and Syrian marble floors. Wrought iron front doors welcome you in and automatic Hunter-Douglas shades by designer David Salem grace the windows. 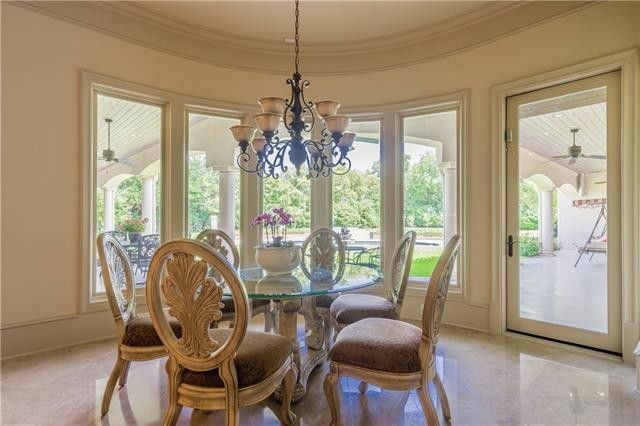 The formal dining room with double-sided glass doors leads to the front patio. Second living area with Syrian marble gas fireplace, sitting just off the kitchen. 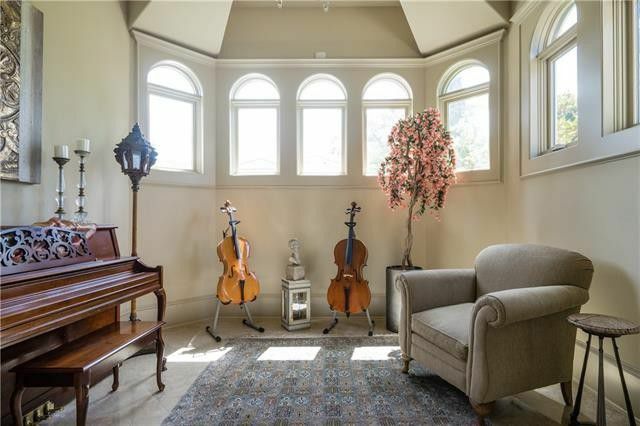 Just off the kitchen is a butler’s pantry with lots of storage and a flex space being used as a music room. There are also two studies: the formal one has built-ins and an extra large closet; the second has four built-in desks and storage. 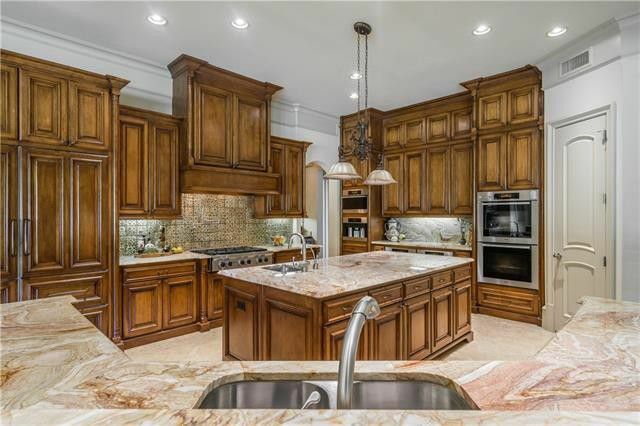 Double-height cabinets and Miele professional-grade appliances make the kitchen a dream. 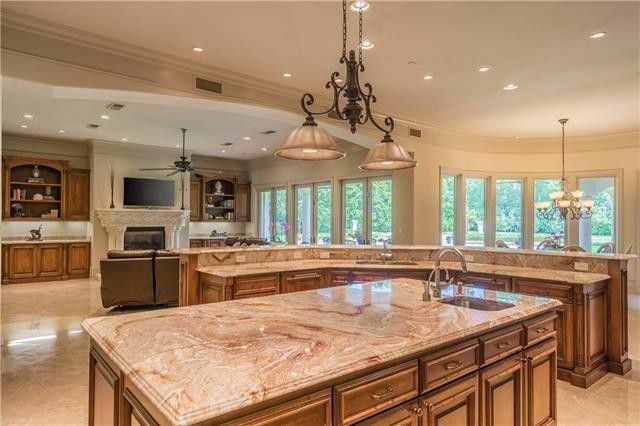 Plenty of working counter space overlooks the breakfast area, second living room, and beautiful backyard. The breakfast area overlooks the resort-inspired pool. To the right is built-in storage. 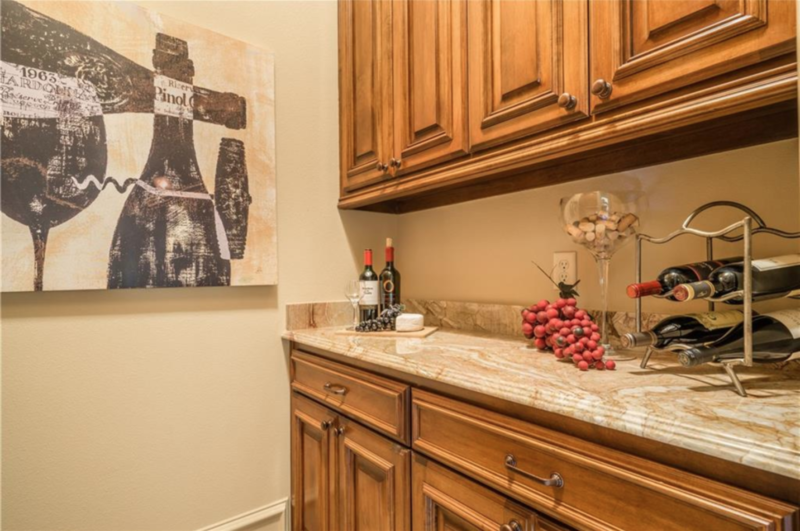 The butler’s pantry has tons of built-in storage space. 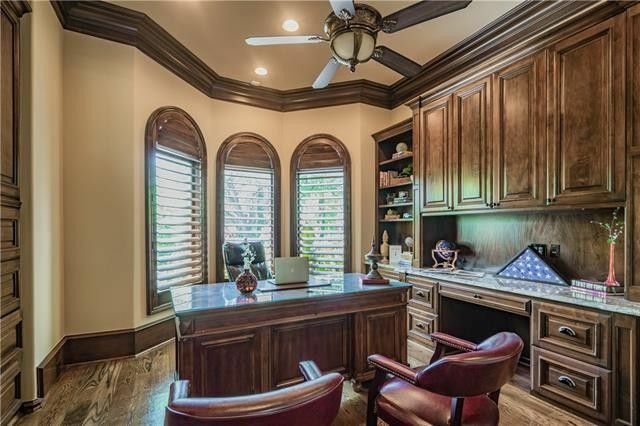 The formal office offers built-in cabinets and an extra large closet. Tall windows offer view to the front of the house through plantation shutters. 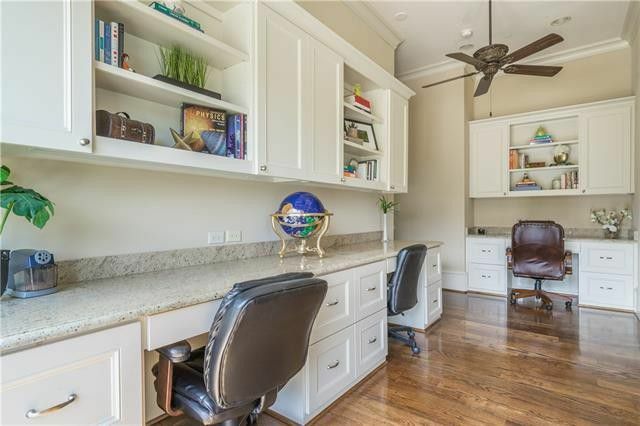 An extra study off the kitchen has four built-in desks and storage spaces. Perfect for homework or crafting! 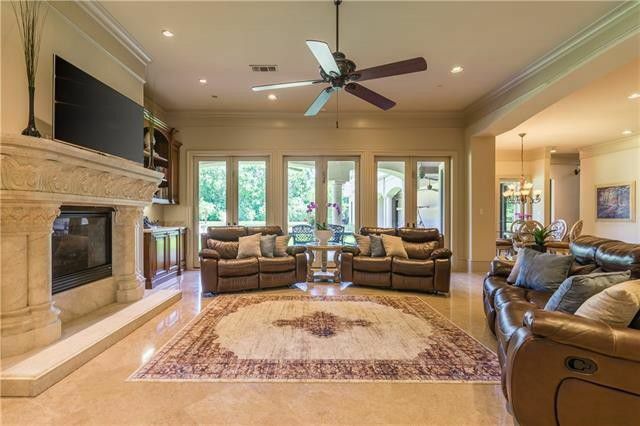 Just off the kitchen, a flex room offers opportunity for a sitting area, music room, wine-tasting gathering center, or anything else your heart desires. A private coffee bar and secluded outdoor courtyard await in the downstairs master suite, with a granite-laden bath fit for royalty. The courtyard has an outdoor shower, fountain, and sitting area. Just outside the master, find the private office and workout room. and built-in desks, and cabinet space. 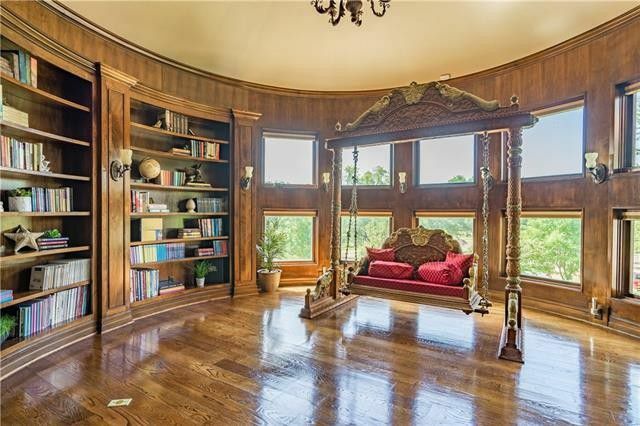 All of them except one are two stories with spiral staircases leading to a loft connecting the other two bedrooms, and a passageway to a private reading nook/overlook. 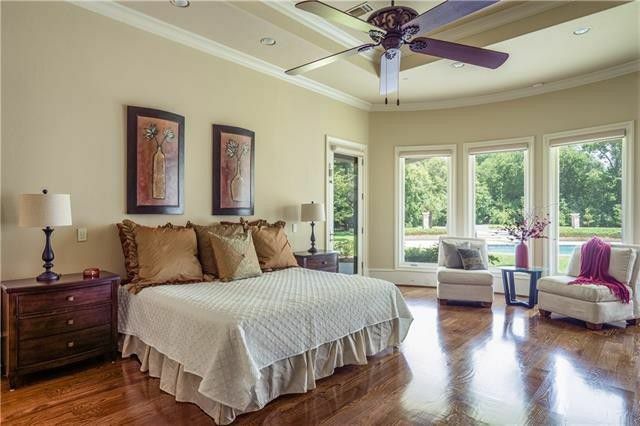 Master suite with Syrian marble gas fireplace, private exit to backyard, and a coffee station. 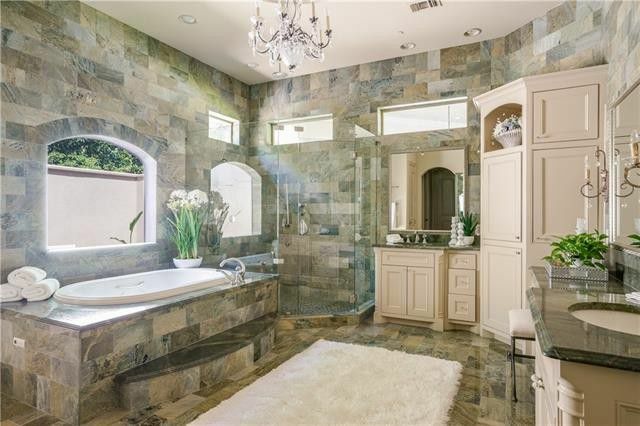 The master bath has separate vanities, a jetted tub, two walk-in closets, separate commodes, and a frameless glass shower. 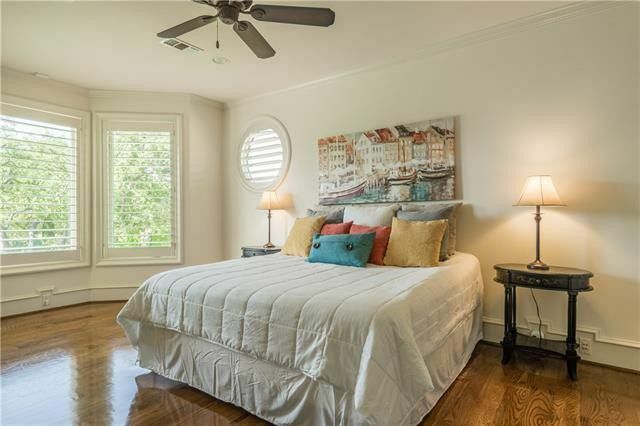 One of four upstairs guest suites with a built-in desk, walk-in closet, and plantation shutters. One of three secondary bedrooms with a built-in desk, walk-in closet, full bath, and terrace access. 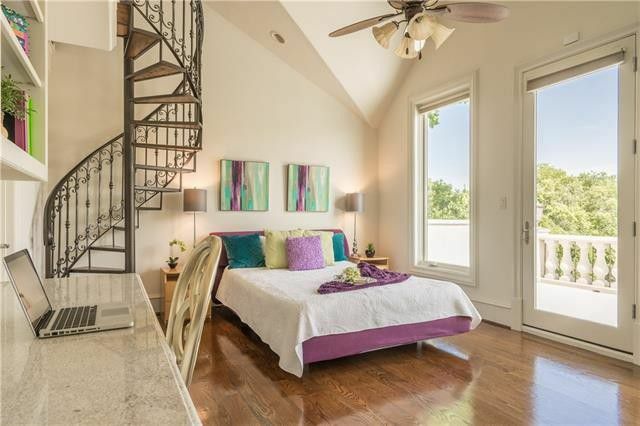 A spiral staircase leads to a loft connecting the other two bedrooms, and a passageway to a private reading nook/overlook. 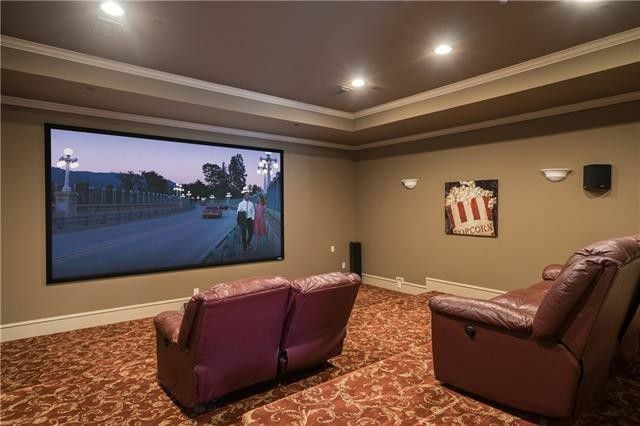 The library, theater, and game room offer fun spaces upstairs. 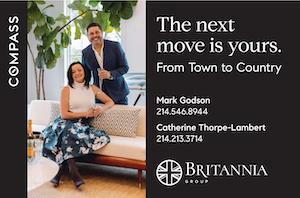 The outdoor terrace is larger than many houses, at 2,400 square feet! The circular library upstairs offers a quiet place to read, just off the entry to the elevator. 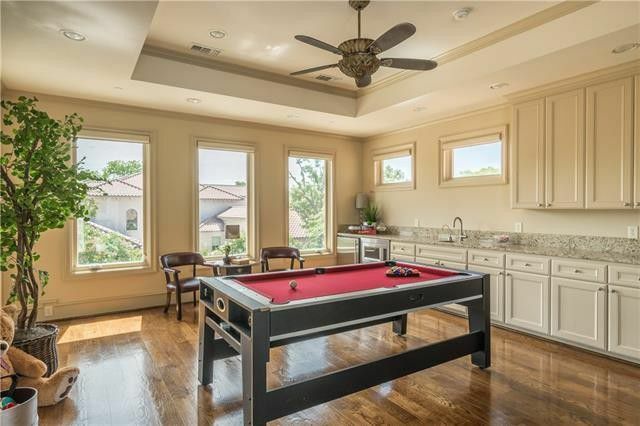 The upstairs game room has a wet-bar, built-ins, and access to the massive terrace. A dedicated media room features ample seating, professional sound, a projector system, and dumbwaiter from the downstairs kitchen. 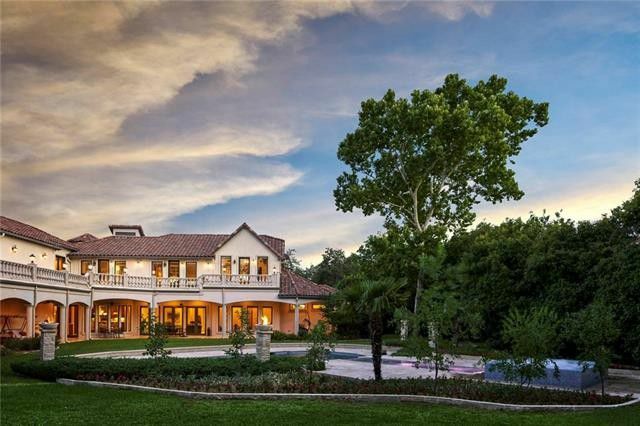 This home is listed for $5.5 million. 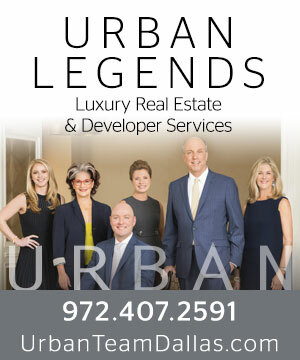 For more information or to schedule a private showing, call Nilza Rueckert or Evan Stewart at 972-204-5805. 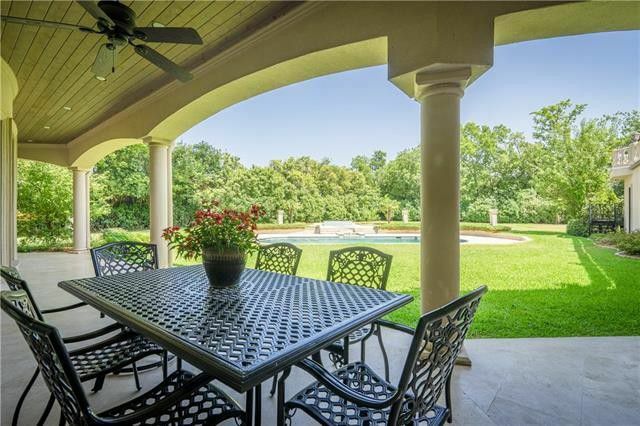 Over 1 acre of resort-inspired landscaping with a beautiful swimming pool, hot tub, and incredible yard space. The patio features gas connections for an outdoor kitchen as well as a separate cabana bathroom. An entertainer’s paradise where fun features like a spa fountain, changing pool lights, and fire pillars create an atmosphere unlike any other.